His Grace, Archbishop Bernard Longley has appointed the Vicar General of the Archdiocese, Mgr Timothy Menezes, to be the Acting Cathedral Dean and to take on this responsibility from now until the summer. Welcome to St Chad’s, the first Catholic Cathedral erected in Great Britain in 1841 following the Reformation of the 16th Century. St Chad’s was designed by the great Gothic Revivalist Augustus Welby Pugin, who was also responsible for the Palaces of Westminster and the iconic clock tower of Big Ben. The Cathedral is home to the relics of St Chad, which were originally interred in a shrine at Lichfield Cathedral in the year 672 AD. The Cathedral celebrated its centenary in 1941 and was designated a Minor Basilica by Pope Pius XII. St Chad’s is known across the world as a beautiful building with a remarkable history and a rich heritage. But it is first and foremost a House of God. 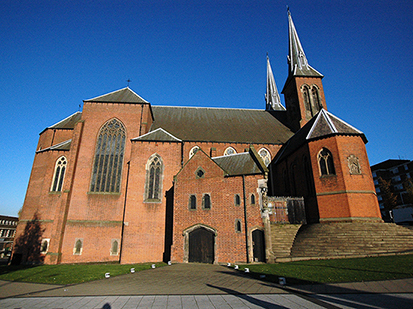 St Chad’s is the Mother Church of the Catholic Archdiocese of Birmingham which covers five counties. It is a place for worship and prayer, a place where we can meet God and offer him our praise and thanksgiving and bring him our needs and concerns. I hope that you will capture something of the beauty and the love of God as you explore our web-site. Catholics believe that we all need God, and that we discover and know him through faith in his Son Jesus Christ. Jesus founded the Church so that his message of faith, hope and love could be passed on to every generation. Our mission at St Chad’s is to offer that message of faith to everyone. God wants to touch your life and to help you achieve your full dignity as a human being. In other words, to become like Jesus the perfect man. I pray that all of us here at St Chad’s can help you in your journey of faith.